Sailing on the NCL Getaway. Book before March 14, 2019 and get an additional $50 stateroom credit (limit 1 per stateroom) in addition to any current promotions! 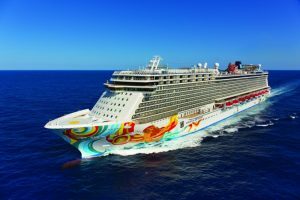 Norwegian Getaway combines the most magnificent amenities Norwegian has to offer with unforgettable destinations. Stroll The Waterfront, an innovative, industry-first open-air promenade designed to connect guests with the ocean like no other cruise line. Indulge in more than 28 dining options, experience the thrill of five water slides, and three levels of action-packed activities in the sports complex. The excitement and entertainment continues with Broadway musical Million Dollar Quartet. Get ready to explore the white sand beaches and deep-blue waters on a Bahamas or Caribbean cruise, build a pink sandcastle in Bermuda, explore history up close in Europe, or just relax at sea on a Transatlantic cruise. Miami’s Ultimate Ship is your ultimate getaway.